Midfielder Shane McGinty helped himself to a hat-trick at Bangor. Institute booked their place in the Intermediate Cup quarter-final following a deserved 5-2 extra-time win at Bangor. Midfielder Shane McGinty helped himself to a hat-trick, in a tie, which should have probably been finished in the 90 minutes. 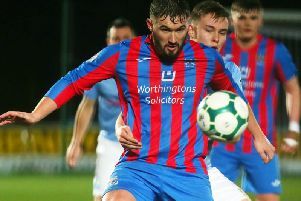 The Drumahoe side always looked dangerous on the counter attack and some of their passing moves would have impressed the watching Linfield boss David Healy. However it was the home side who had the first real chance on five minutes as Kris Pike’s inswinging corner from the right found George McMullan, but his close range header was blocked on the line by Ryan Morrow and Andy Morrow’s follow-up header was saved by keeper Martin Gallagher. From the resulting corner Bangor’s Morrow was denied by the woodwork as his downward header hit the post. Just after the half-hour mark veteran striker Paul McDowell saw his long range strike flash just past Gallagher’s right hand post. Institute were awarded a harsh penalty on 43 minutes after Dean Youle was adjudged by referee Neil Robinson to have pushed Jamie McIntyre inside the box and McGinty fired home from 12 yards, giving Bangor keeper Darren Gibbons no chance. The home side levelled things two minutes later when Youle, who will feel justice was done, headed home Pike’s inswinging right wing corner, after getting away from Stephen O’Donnell. A Mark Cooling cross found Gerard McMullan on 48 minutes but the winger’s shot from 15 yards was superbly tipped over by Gallagher. Institute went straight up the other end and Gareth Brown should have done better but his effort was kept out by Gibbons. Gibbons denied Brown again on 51 minutes but this time that man McGinty was quickest to reaction and fired home his second from a tight angle. Moments later Bangor’s McDowell had another chance but his header from Gareth Beattie’s cross flew well over when he was well placed inside the box. The Seasiders equalised for a second time on 69 minutes in somewhat bizarre circumstances when Pike’s free-kick, close to the right side-line went all the way through without no one getting a touch and the ball found the net. On 86 minutes Robbie Hume had a good chance, but after a neat passing move, the Stute substitute, with his weaker right foot, blasted over. In the closing stages Jamie Dunne went close to winning it, but he was unable to keep his recent good goalscoring run going, as his close range header was straight at Gibbons. Stute had a super chance to regain the lead early in extra-time, but Hume fired over from just inside the box, as the visitors started to get on top. Kevin Deery’s side deservedly scored a third on 95 minutes as McGinty completed his hat-trick, making no mistake after a defensive error. The visitors added a fourth in super fashion on 97 minutes when sustitute Oisin McMenamin played in Hume and he raced away from the Bangor defence, before slotting the ball past Gibbons with his right foot. Institute scored a fifth on 103 minutes when Brown broke the offside trap before calmly side footing home past Gibbons. Bangor: Gibbons, Beattie, Pike, Wray, Youle, Walsh, Curry, Cooling, Morrow (Watson 24/Lynch 83), McDowell (Sills 66), McMullan. Institute: Gallagher, Roddy, O’Donnell, Scoltock, Morrow; McAuley (McMenamin 76), Harkin, McGinty; Browne, Armstrong (Hume 61), McIntyre (Dunne 66).